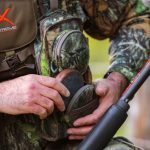 Clover is something of a do it all plant that appeals to two of the most sought wild game in America, whitetail deer and wild turkey. The plant itself is incredibly nutritious, with some clovers providing up to 25% protein in each pound or two. That’s exactly the type of protein requirement that a thriving herd of deer needs, particularly for healthy antler growth. When deer discover a good-sized clover patch, odds are very high they will be back for more. While turkeys will also eat clover flower, they more often zero in on the prodigious insect life that clover attracts. Clover leaves provide a dense foliage cover for insects to hide in. All those sweet nectar filled flowers are a feeding haven for insects of all kinds, providing a food source for turkey to thrive on. With insects at the ready they won’t hesitate to make their nests directly in a plot of clover. It’s the perfect training ground for young turkey as soon as they begin pecking. The rest of this article covers all you need to know about choosing and planting clover food plots. Learn about the varieties of clover, when to plant, and the best clover seed for your food plot. The main advantages to clover are that it’s inexpensive to grow, maintenance free, and pleasing to the eye. Once past the initial investment of buying seed, there future costs are minimal. Because clover is a perennial, it has a multi-year life span before it needs to be reseeded. Another bonus is the rabbits and quail that will flock to it. Easily Established: Clover does not need any tilling, in fact, if planted clover seeds are more than one-quarter inch below ground, it won’t survive. That means, when seeding, spread it around by hand, per package directions on how many pounds per acre, and forget about it. The clover seed will sprout naturally over the course of one week, and if the soil is prepared or you get a couple good rounds of rain, it may sprout in as little as 2 or 3 days. Low Cost: As stated, clover seed is very inexpensive, even the best clover seed blends won’t break the bank. The best clover seeds all come from brand name companies, where you’ll get high quality without any filler. But, if you really want to go on the cheap, and results will vary, virtually any agricultural seed and feed store will carry clover seed. It may not be the best solution, but if you are on a budget, it will get the job done. Varieties for any Climate: Clover is not fussy when it comes to climate. Many clover types do just fine in the northern or southern hemisphere, but there are some that do better than others, and we will get into that when we address the types of clover to plant. Where to Plant: The ideal place for a clover plot is directly next to a wooded area. Both deer and turkeys love the safety of the woods. If a main source of food is right next to their safety area, they will be more inclined to use it. Clover food plots should cover at least 1/2 an acre, and always make it longer and narrower than wide. A good rule of thumb is for every 25 acres of woods, seed in 2 acres of clover, but since deer are larger and can cover more ground, you can put in any size plot with your available land. How: For maximum results, lightly till the area, pressing the seed into the soil using a roller, or lightly rake over the seeds. Do this a day before it rains if possible for the highest success rate of germination. For pure clover with no other plants in the plot, mow the area and spray with a total herbicide to kill off all the vegetation. When it turns brown, till and seed the clover. The dead thatch will shelter the seeds and allow them to germinate. When to Plant Clover: In northern climes, the best time to sow clover seeds are in the early spring and summer, especially when the soil is damp and moist. You can also sow clover seeds in late September and early October. This allows the clover to establish a root zone before going dormant in the winter. In southern climes, just make sure the soil is moist, and you’ll be good to go. There are 5 main types of clover that will appeal to both deer and turkey. We’ll give you an insight on each one below. Red Clover: Red clover is considered a perennial except in the deep south, where it is more like a semi-annual. 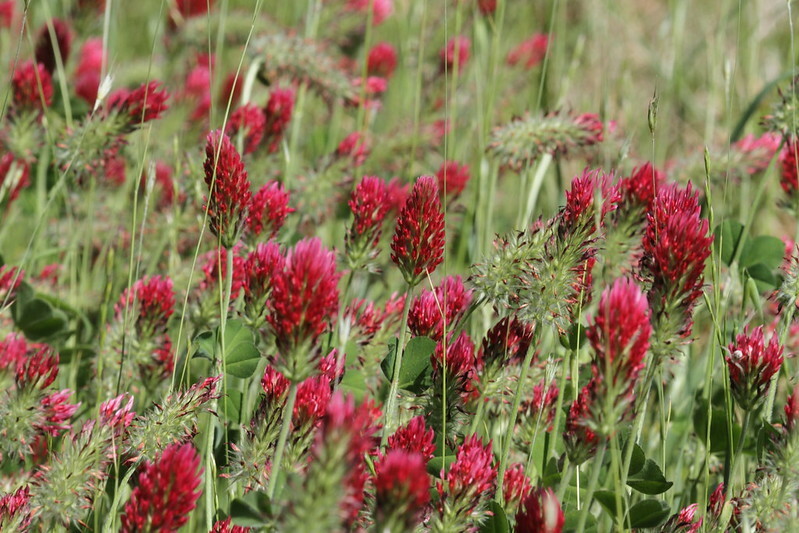 It produces a big and bold flower that can be a good addition to any clover plot. Red clover is not ideal for deer because the longer stems of red clover have more lignin than others. This makes it a little more difficult to digest for deer. The red flowers attract a plethora of insect life, so for turkeys, it is one of the better clovers to plant. Crimson Clover: Not to be confused with red clover, crimson is considered an annual and works best if planted every year. Although it can continue to self-germinate with lower growth results, for years without any help. It does not tolerate heat very well, so it is best in northern climates. With a higher protein ratio, it is especially nutritious for deer, and the flowers also bring in a large amount of insect life. It needs more care during planting than other clovers, but once established, it puts nitrogen back into the soil, which helps other plants around it grow hardier and healthier. Arrowleaf Clover: This is primarily a southern or southeastern perennial species that both deer and turkey love. It grows best on well drained soils and is seeded in the fall, generally by broadcasting the seed with a seeder or by hand. It is considered a perennial variety, and it will reseed itself in the late spring. Berseem Clover: Berseem is most prolific from the eastern seaboard out to the Midwest, and along the far west coast. It is considered a summer annual in northern climes, and a winter annual down south. Seeding can be done after the last signs of frost in the Midwest, usually by the middle of April. In southern regions seeding can be done in the fall. At the Mississippi Deer Lab, Frosty Berseem clover was considered the best clover for deer, found to be preferred over every other clover available. Ladino Clover: This perennial clover is a hybrid developed specifically for food plots. It gives both deer and turkeys exactly what they need, in an easy to seed clover. Ladino can be planted in the spring or early fall, and is considered one of the best clovers for both species. It should be mowed a couple of times per year to keep it robust and growing. A no-nitrogen fertilizer can also be used in the spring to encourage growth and overall health. If you have a choice to plant just one clover for both deer and turkey, this is the one. (Bonus) Durano Clover: Durano is another hybrid type of clover developed specifically for feed plots. It has very similar attributes to Ladino clover, and is also an excellent choice for planting if you are only going to have just one type for both species. While clover is a considered optimal choice for deer and turkey food plots, you should seriously consider planting a mix. The optimal clover food plot will consist of several varieties with the potential to bring in the animals you seek. Each seed mix is coated with a starter fertilizer for rapid initial growth. Here is a list of 5 clover blends that should be considered. Imperial was the first feed-plot genetically selected clover designed specifically for deer. Made primarily of Ladino and Berseem clover, along with traces of alfalfa, it can produce growth lasting up to 5 years. The seeds are coated with a special coating for improved seed survival, and features the JumpStart formulation for quick initial growth. Imperial is tolerant of cold and resistant to heat and has been successfully grown across all regions of North America. This perennial clover mix has 4 distinct types of clover, with Ladino and Berseem the primary, along with some chicory and rapeseed too. Antler King has one of the higher protein concentrations, with an acre producing up to 10 tons of forage per acre, and 30%+ protein. The four-clover blend is very pleasing to look at once grown in, especially when the clover blooms. Antler King Clover is formulated for all climate zones, and under good conditions can last up to 6 years. This 5 year perennial blend features 3 different clovers; Ladino, Dutch white, and Arrowleaf. Like most commercial food plot mixes, the Cabela’s blend has a Micro Boost seed coating to power the initial plant growth after germination. You can seed a half acre with 5 pounds of seed mix. The coating also adds nitrogen to the soil, which is critical to achieving multiple years of clover growth. For the price, the Cabela’s Clover is a very good value. This Mossy Oak mix is a combination of clovers from New Zealand. Included in this clover blend are diverse types of white clover, red clover and Berseem clover. It is northern zone hardy, but grows best in the Midwest and southern climes. Because it is clover, it will attract wildlife, but if you are attempting to target deer, turkey or both, there are better blends available. With a blend of white and red clovers, it is basic as far as clover blends go. Evolved Harvest is the only clover blend with a professional endorsement, but take that with a grain of salt. It is mid-priced as far as blends go, so it is a good deal, but a straight Ladino and/or Durana may be a better bet. The main drawback is it appears to only be available in 2lb bags. Keep in mind these blends will give superior initial performance over non-coated seeds, thanks to the special coatings. Just remember that in the real world, not the manufacturers controlled test world, none of these blends can be proven to attract deer or turkey better than anything else. That’s not a knock, just a reminder to remember that the results may vary from plot to plot. All you can do is your best to select the plot site and prepare it for success as best you can.